The Harriers are governed by a Board of Directors composed of seven members who manage the operational, financial, and planning elements of the team. Board responsibilities include publishing the weekly newsletter, coordinating team social events such as First Thursdays, and planning the annual Harrier Holiday and Summer parties. Board members are elected each year in February and hold two-year terms. Any member in good standing is eligible to self-nominate and run for an open board position. The Harriers are coached by a veteran and accomplished group of runners. The coaching staff, led by Head Coach Scott Bartucca and Coaching Director Katharina Wang, collectively designs and executes the Harrier Training Plan (available to all dues paying members), leads workouts, and holds an annual coaching clinic. Our coaches are certified by organizations including Road Runners Club of America (RRCA) and USA Track & Field (USATF). As a group, they have more than five combined decades of experience racing competitively in road racing (both short and long distance), cross country, and track. A runner for over 20 years and former “fastest base runner” in little league, Scott Bartucca joined the Harriers in 2008 and has served the team as a coach since 2011. He has coaching certifications from RRCA and USATF, and broad experience in developing and implementing group and individual training plans for a variety of racing goals. Though starting out as a high school sprinter and hurdler, Scott has since become an experienced racer at the full spectrum of distances from 1 mile up to the marathon, with 22 marathons, including 5 Boston marathon finishes, and over 30 half marathons to his credit. In addition to the Harriers, Scott has also led runs for Asics and coached the ASCPA and Doctors Without Borders NYC marathon charity teams. When not running, you can probably find him baking, playing the oboe, or buying cat t-shirts. Katharina "Kat" Wang found her love for distance running in high school and continued to run at the collegiate level at New York University. She joined the Harriers in 2013 and has been coaching morning workouts for the Harriers since 2015. Kat also shares her passion for donuts with the team by scheduling monthly donut long runs. Her favorite donut is the buttermilk donut from Peter Pan. As of winter 2017, Kat has completed 7 marathons, 9 half-marathons, and had a crack at an ultra-marathon stage race across the European Alps (ask her about it when you meet her). Kat has a strong disdain for hot temperatures and high dew points-she wishes every day could be a perfect 30-40 degrees. You will often find Kat running in Central Park with the love of her life, Chomper (a black lab mix). Laura grew up in Ireland with a family very involved in running. At age 16, in an act of defiance she decided she hated all things running related and then went on hiatus for years. Laura did not start back running until 2012. 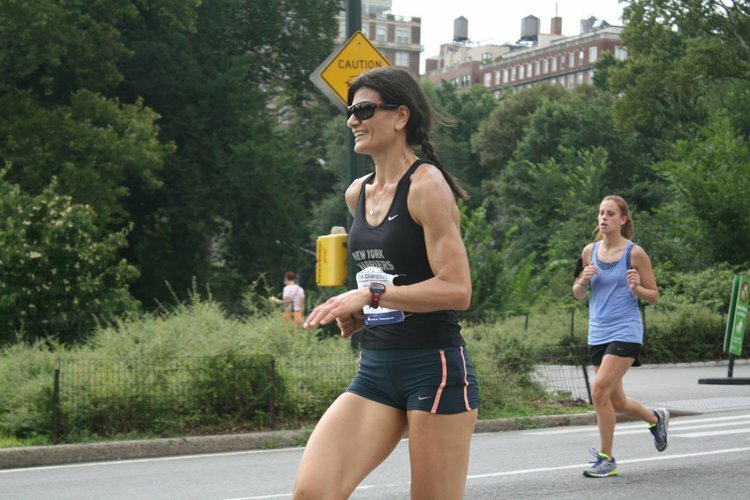 Then in 2013 she realized running alone along the flat East river wasn’t enough, and looked into the groups she saw training at the East 6th Street track and found the Harriers were the perfect match. Since then, Laura has been a regular attendee of the Wednesday workouts, and now has more of a presence at Friday night's Tempo workout. Laura is a big fan of Guinness and feels a few pints is key pre-race prep the night before any race. Morgan tried to join her high school track team as a thrower, but somehow ended up running cross country. She quickly settled into her true home among runners and continued her career as a middle distance runner at Colby College. She later spent so much time training with marathoners that she decided to experiment with racing long distances and found a new love for those, though 400m repeats will always be her favorite workout. Morgan started researching running teams before apartments in preparation for her 2016 move to New York, and knew her deep dive into the internet paid off immediately upon showing up to a Harrier long run. Though Morgan's preference would be to spend all her free time running, she also enjoys cooking, reading, and eating (usually simultaneously). The Harrier captains are the leaders of the team responsible for ensuring the overall enthusiasm, competitiveness and consistency of the team.